Home 200 X2 is Niwa's mid-range Starter System for entering the world of Modular-Solar-Systems (MSS). With 2x ceiling lamps the system offers a very comfortable start into complete energy independence. Each lamp offers impressive 100 Lumen brightness which brings total system brightness to 200 Lumen. More than enough for the living room, kitchen or sleeping room. All lamps are water and dust proof and can also be installed as outdoor lamps serving as security lights. 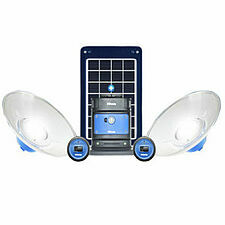 Lamps can be individually dimmed (3x Light Modes for each Lamp) according to the situation of use, room size and sunshine duration at a particular day. Dimming takes place conveniently at a wall switch for each lamp.